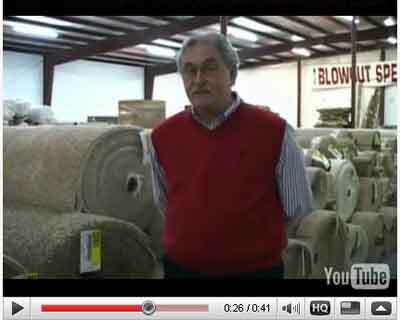 Owen Carpet Co. Inc. located in Dalton, Georgia has been in business since 1974. What started out as a small family owned company selling manufacturer specials has become one of the largest wholesale flooring outlets in the nation. Our 50,000+ square feet warehouse/showroom is packed full of bargain priced flooring options for both the home & office. We can ship your order to any point in the country, or overseas. We use the best Common Carriers in the hauling business whom we know and trust with your new floor. If there is any trouble with your shipment, we will be here to assist you in every way we can. We can ship to a dock in your area for pick up, or directly to your home or business. If you would like to visit our showroom, please feel free to drop in to see us at your convenience. Directions: On I-75, we are 30 minutes South of Chattanooga, TN or 1 hour North of Atlanta, GA. Traveling North on I-75 : Take Exit 328 (Conn 3). Turn left and proceed to the 1st traffic light where you will turn right. Go about a quarter of a mile and you will find us on the left. Traveling South on I-75: Take Exit 328 (Conn 3). Turn right and proceed to the first traffic light and turn right. We are about a quarter of a mile down the road on the left. You can expect huge savings on all your flooring needs at Owen Carpet. We offer a wide variety of flooring products for both residential and commercial flooring applications. You can feel free to shop locally for the carpet or flooring product of your choice, or browse our online offerings for bargain priced flooring materials that we have found to offer the best "Bang for the Buck". 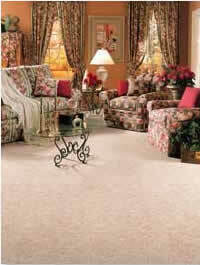 Carpet is our main product offering. We specialize in finding the most economical home carpet choices in Textured Plush Carpet, Shag Frieze Carpet, Berber Carpet, Printed Carpet, and Outdoor Carpet from all the major carpet manufacturers such as Shaw, Milliken, Mohawk, and Beauliu. We also offer a complete line of Carpet Tiles, Commercial Carpets, Carpet Closeouts, and College Team Carpet, Rugs, and Mats. If you need help finding the best carpet to fit your needs, give us a call to discuss your situation with one of our trained carpet professionals at 1-800-626-6936. Carpet pad is an integral part of your carpets performance. We offer a full range of padding options including standard Rebond Carpet Cushions as well as specialty pads like Stainmaster carpet pad, SpillGuard, rubber carpet pad, Synthetic "hair and jute", Bio-friendly "Healthier Choice" frothed polyurethane carpet pad, and are proud to offer the newest "GREEN" Shaw carpet pads. Vinyl Flooring has been a specialty for many years at Owen Carpet . Our inventory offers the very best vinyl flooring available at the most economical prices. We stock 1000's of rolls from all the major vinyl flooring manufacturers such as Armstrong Vinyl Flooring, Mannington Vinyl Flooring, Tarkett Vinyl Flooring, Flexitec Vinyl Flooring, Congoleum Vinyl Flooring, Karndean Vinyl Flooring, Stainmaster Vinyl Flooring, Konecto Vinyl Flooring, and Domco Vinyl Flooring. We also have specially made wide width vinyl flooring for seamless installation in larger areas. Owen Carpet is your one stop source for discount wood flooring. We offer solid wood floors by Shaw, Bruce, Robbins, Mannington, Mohawk, Hartco, Anderson, and many more. All wood species are available including Oak, Brazilian Cherry, Bamboo, Maple, Hickory, Pine, and most other exotic wood floors. When you shop at Owen Carpet, expect great savings on your hardwood flooring purchase. To help maintain your new floors look for years to come, Bona made their Bona Hardwood Flooring Cleaner. Their easy floor cleaning system is a simple and cost effective way to clean your hardwood floor. Laminate wood flooring is a more durable alternative to solid wood floors. We carry virtually every name brand of laminate flooring including Pergo, Quick Step, Mannington, Columbia, Mohawk, Shaw Laminate Flooring, Kronotex, and more. Some laminate floors are so real looking with beveled edges and textures only Mother Nature would know they are not real wood floors. Today's laminate floors just snap together - No Glue Required which makes them great for the do it yourself consumer. Ceramic Tile and Porcelain Tile are sound flooring investments for any home. We stock only first quality tiles by Florida Tile, Crossville Tile, Daltile, Mohawk, Shaw, and Mannington. Alternatives to traditional ceramic tile are DuraStone and DuraCeramic by Congoleum. These products look like ceramic, porcelain, or natural stone tiles but retain heat and feel like a warm tile underfoot. We also carry all flooring installation supplies. A wide variety of Area Rugs are available at wholesale prices you will find hard to believe. We carry a variety of College Football and Basketball, NFL Team, and MLB Team area rugs and College Area Rugs that will make any sports fan happy. If you have a design in mind that is not covered we can put your thoughts into carpet. Custom Area Rugs are available to help customize your home to suit your tastes. We also have Milliken Area Rugs that come in various shapes, sizes, and colors to please anyone who wants a beautiful rug. In our closeout section, we offer many Room Size Area Rugs that will bring life to any room. If you have children, we have a limited supply of Kids Rugs, Teaching Rugs, Vinyl Back Children Rugs, and Custom Printed Area Rugsthat any child would enjoy playing, sleeping, or sitting on. If you're a nature lover, or just enjoy soft feeling material beneath your feet, our Wildlife Rugs and soft Shaggy Frieze Rugs are just right for you. Owen Carpet also carries a variety of flooring cleaners. Whether it be carpet cleaners, hardwood cleaners, vinyl cleaner, laminate cleaners, stone or tile cleaners, or treating your carpet with Scotchgard Carpet Treatment, Owen Carpet is here to assist you in maintaining floors for years to come.